UNIONS HAVE MET with TDs and senators to discuss the looming crisis at Bus Éireann. In a statement this evening, Siptu said they attended meetings with politicians and the Labour Court to discuss the situation “following threats by management to implement massive cut backs at the public transport company”. SIPTU organiser, Willie Noone, said the union’s meeting with the Labour Court “did not involve any engagement with the proposals” but said representatives engaged with the court to assist its investigation into why the company has requested its intervention at this stage. Meanwhile, the National Bus and Rail Union (NBRU) criticised comments made by the company chief around the potential loss of 2,600 jobs at the company. Dermot O’Leary, general secretary of the NBRU, said that talk over mass job losses at the State-owned travel service represented a “threat” to workers. “We see it as a threat rather than a warning,” O’Leary told TheJournal.ie. Last week Bus Éireann workers and unions rejected a plan presented to them by management around making savings at the company. Measures in the plan would include moving workers around the company, cuts to premium pay rates and potential job losses. The unions representing the workers – which include Siptu, the NBRU and Unite – are due to meet Thursday where they will discuss what action to take. Industrial action is a possibility. Company CEO Ray Hernan is due to appear before the Oireachtas Transport Committee tomorrow to discuss the matter. In his submission – seen by RTÉ News - Hernan that the 2,600 workers of Bus Éireann could lose their jobs if losses at the company are not shored up. RTÉ reports that Hernan said that the company’s financial situation is “critical”. He states that losses at the company for last year could reach €9 million. “This is not scaremongering: this is the stark reality of what this organisation now faces,” Hernan states. He also denies that management is targeting workers to fix the company’s financial troubles. 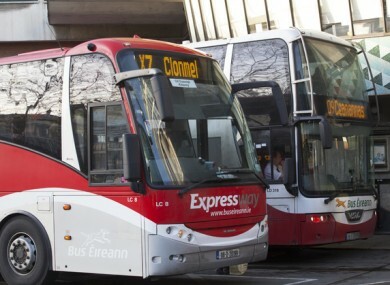 The unions rejected an invitation to meet with Bus Éireann executives today to discuss the proposals. Dermot O’Leary said that unions have already been given a mandate for industrial action when they balloted their members last month. O’Leary said that unions would be lobbying TDs today to intervene in the dispute. He called for all the concerned parties in the dispute to come together for a multi-stakeholder meeting in order to discuss the future of the company. This meeting would include representatives from the National Transport Authority and the Irish Government. “All the concerned parties need to meet,” said O’Leary. Raiding bus workers’ wages in not a tenable or sustainable solutions and will not be accepted. Email “Union bosses meet with TDs as Bus Éireann industrial action remains on the cards”. Feedback on “Union bosses meet with TDs as Bus Éireann industrial action remains on the cards”.